For those of you who are familiar with playing progressive jackpot products, it’s probably quite fair to say that the vast majority of these products are video slots with stellar graphics and game play included in them, right? Well, NetEnt have also created a progressive game which brings the twist of a traditional slot to the forefront of its offerings. 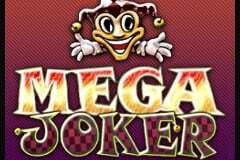 Mega Joker Jackpot is that game, and you’ll be able to see from the first instance of loading up the game, that it’s laid out with the image of a physical machine that could be found in many land-based casinos throughout the years. There are flashing lights, the pays are shown all around the reels, and you’ll also be able to see that you’re playing the game in what appears to be a NetEnt branded establishment, giving you the possible thrill of feeling like you’re in an actual casino. And yes, while it may not be as graphically advanced as many other products from the provider, it still has enough visual appeal to make it intriguing to play. This game is presented to its players with two separate reel sets. Both are three reels and three rows large, although they have slightly different circumstances for their activation. The bottom set of reels is where the main game is played, and upon these reels, you’ll find a variety of classic fruit symbols. So, therefore, you’ll get to spin through imagery of cherries, watermelons and lemons, as well as several additional icons such as the treasure chest, bells and symbols of the joker as well. The second set of reels, which you’ll find at the top of the machine, will come in to play as part of the Supermeter Mode, which we’ll explain a little bit later on. As far as the pay lines which have been included go, both sets of reels feature five of these, and they are not able to be altered in any way. However, players do have the chance to change their bet around per spin, and this is done by using the coins shown in the bottom right hand corner of the screen, as well as the ‘Bet’ button on the interface. The first of these, you can clearly see, offers up either a €0.10 coin or a €0.20 coin to choose from. Meanwhile, pressing on the ‘Bet’ button will alter the amount of coins wagered between either a single one or 10 of them. This allows a maximum overall wager of €2 per spin to be played, and you’ll be able to see the progressive jackpot amount increase with every bet you place. It's Mega...and It's a Jackpot! You’ll clearly be able to see the pay outs of the game surrounding the reels, so it’s pretty simple to understand what you need to match up in order to receive a winning combination. Jokers will obviously provide the biggest pay out in the base game, with three of them offering up to 400 coins if you’re wagering a bet of 10 coins. The aforementioned Supermeter Mode comes in to play whenever you make a winning combination on the base reels of below 2,000 coins, and you must be wagering with the maximum of 10 coins as well. In this round, the top set of reels begins to work, and you’ll find that there have been extra symbols added to these, including 7s, oranges and grapes. In this round, you can bet 20, 40, 100 or 200 coins per spin, or alternatively, you have the option of collecting the money you’ve won by using the ‘Collect’ button. Again, the wins you’re able to achieve in this round can be seen spread out around the Supermeter reels, with a maximum pay out of 2,000 coins being available from the joker icons. It may come as a surprise to learn that although the Supermeter mode is one of this game’s special features, the progressive jackpot amount is not able to be won via it. You’ll need to go another route to attain it. Three percent of each bet played is added to the progressive jackpot amount, and it is actually a randomly paid out amount. The rules do state that the higher the amount of the bet you play, the stronger your chances of winning it are, but on the whole, it will be paid out at a random point of game play to a random player. So, there’s no special bonus rounds to go through, just continue playing with the hope of receiving it. To put it simply, Mega Joker Jackpot is not one of the greatest progressives out there, but then again, it’s based on a traditional slot machine, so why would it be? For what it is, it’s a great game to play. It’s simple and easy to understand and doesn’t need any getting used to on the whole.